He denied doing something he's spent much of his presidency doing. Actually, it was a New York Times story, but at least Trump's summary of it was correct. Three people with knowledge of the conversation said that Trump told Kevin McAleenan (whom he was just about to appoint to one of the many vacant Homeland Security positions) that he would pardon any crimes McAleenan might have to commit in keeping asylum-seeking migrants from crossing the border. Recently, Trump fired DHS secretary Kirstjen Nielsen for reminding him that most of his proposed border policies are illegal. 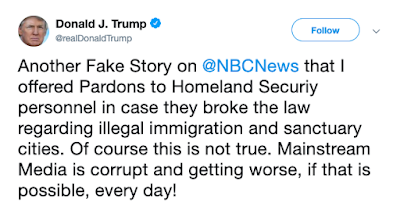 He also told border patrol agents to ignore federal court rulings, and had to be overruled by those agents' supervisors after he left the room. 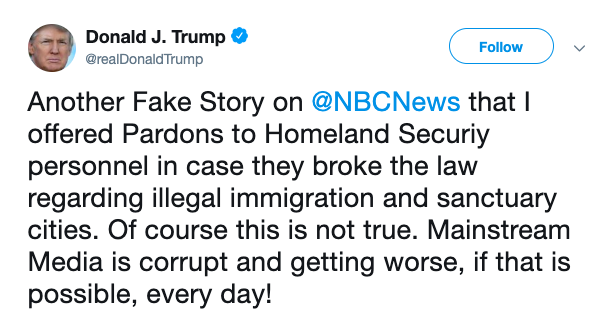 Trump has also publicly hinted that he'd offer pardons to several of the key witnesses in the Russia investigation. It is illegal to use the powers of a federal office to help someone commit a crime. It's wrong to tell other people to commit crimes, even if you can help them get away with it.